November 20, 2013… With a ticket sales increase of 11% – the largest since 1999 – the Festival regained valuable ground in 2013, exceeding the season’s goals. Attendance reached more than 480,000, generating revenue from ticket sales of $29.7 million. Though it’s very early days, the trend seems to be continuing with advance sales to Members up 11% for 2014. In addition to being a smashing success at the box office, Antoni Cimolino’s first season as Artistic Director was also a huge critical success, winning acclaim from critics almost across the board. Five of the season’s 12 productions were extended to meet the demand for tickets, including Mr. Cimolino’s sold-out production of Mary Stuart, which was extended an unprecedented four times. Lapsed patrons (who have not attended in five years) up 76%. U.S. attendance up 8% – the first increase since it began to decline in 2003. In 2013, a number of new initiatives were introduced to make the Festival more accessible to a broader section of the population and to allow a greater number of people to see multiple performances, giving them a richer experience. “We wanted to make the Festival as accessible as possible,” says Ms Gaffney. “To that end, we introduced the bus between Toronto and Stratford, which not only brought more people to the Festival but also made it easier for people to make multiple visits. The new Stratford Direct bus service running twice daily from Toronto at a price of just $20 round trip was a huge success. Roughly 15,000 people used the service, and they bought $1 million worth of tickets. As hoped, the bus helped attract new patrons – 53% of those riding the bus had not been to the Festival before. It also lured a number of patrons back to the Festival: 13% of riders had not attended in two or more years. Inspired by this success, the Festival is launching a bus service from Detroit three times a week in 2014. The Festival introduced two-for-one Tuesdays in 2013. This incentive provided an opportunity for almost 12,000 additional people to attend a performance at the Festival, and 32% of people who took advantage of the two-for-one offer were first-time visitors. The offer drove a 30% increase in Tuesday attendance, along with a 6% increase in Tuesday revenue over 2012. As a result of its success, the program will be extended to include Thursdays in 2014. The Festival also started a loyalty program in 2013, which featured special acknowledgements, perks and selected incentives for its best customers. People targeted by the program purchased $3.7 million more in tickets than they did the previous year. Meanwhile, existing incentives also saw increased sales, including Play On, which offers 16- to 29-year-olds $25 tickets to selected performances – up 57% – and the Family Experience, which offers $36 tickets to children 18 and younger attending with an adult – up 39%. Playcare, a weekend afternoon babysitting service for children 4 to 10 years old, offered through the Stratford Y at just $15. A family concierge in the Avon lobby to assist with children’s needs. Sundays with the Bard, $45 tickets for Sunday matinées of King Lear and A Midsummer Night’s Dream at the Festival Theatre. The Dream Deal, a $99 advance purchase package with tickets to both Chris Abraham’s and Peter Sellars’s versions of A Midsummer Night’s Dream. The Lucky 29 ticket lottery, sponsored by Sun Life Financial, offering $29 balcony seats to non-musicals at the Festival and Avon theatres. Teacher Ticket Deals, offering discounts for teachers to preview plays for student attendance or enjoy a performance on their own. The 2013 attendance figure of 480,232 represents an 11% increase over 2012’s attendance of 432,240. In 2011, attendance dipped below 500,000 for the first time in almost 20 years, hitting 455,044. Tickets for the 2014 season went on sale to Members of the Stratford Festival on November 11. Sales to the general public begin on January 4. 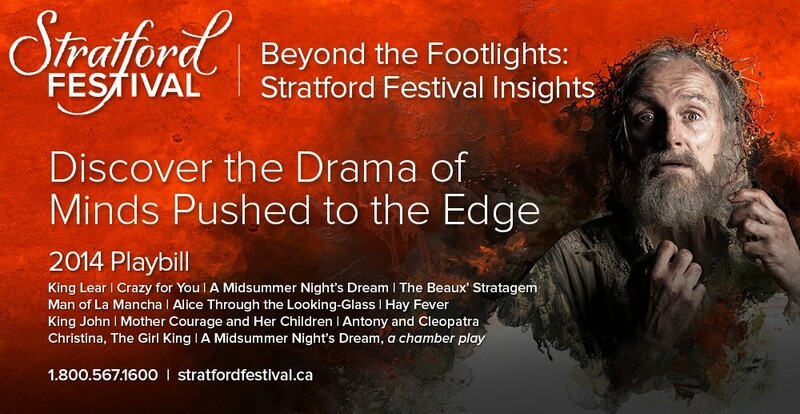 For more information, or to place an order, visit www.stratfordfestival.ca or call 1.800.567.1600. The 2014 season runs from April 21 to October 12, featuring King Lear; Crazy for You; two versions of A Midsummer Night’s Dream; The Beaux’ Stratagem; Man of La Mancha; Alice Through the Looking-Glass; Hay Fever; King John; Mother Courage and Her Children; Antony and Cleopatra; Christina, The Girl King; and more than 150 events in The Forum. May 2, 2013… Calling all pinball wizards! 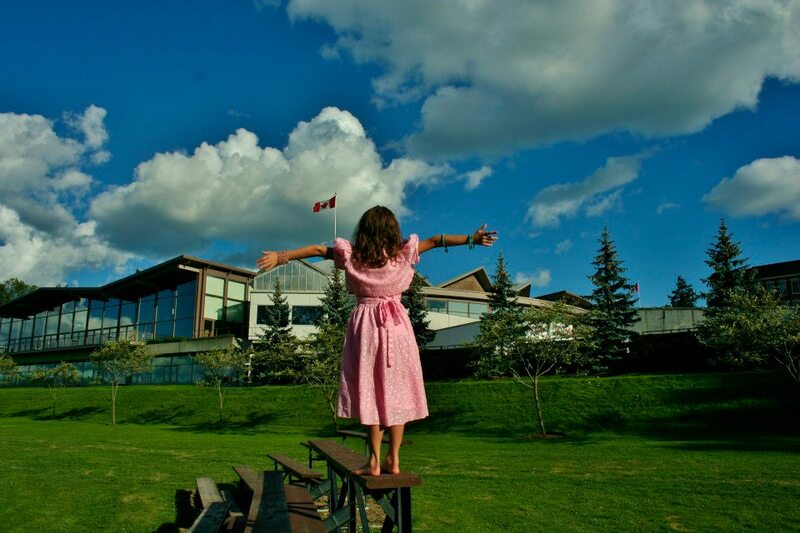 The Stratford Festival invites you to be a part of history. 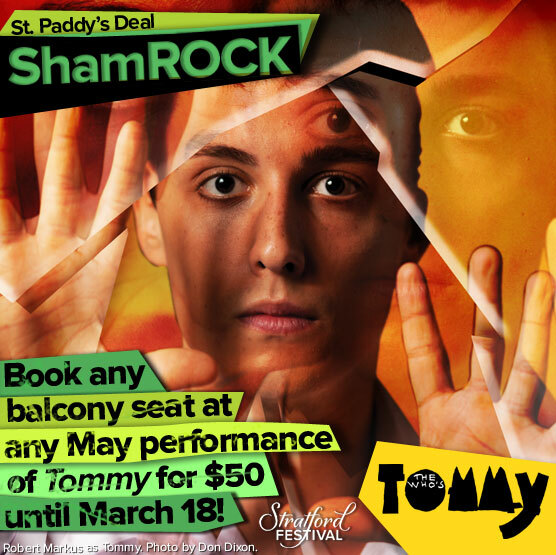 On Thursday, May 16, the Festival will be in Toronto to host Pinballapalooza, an exciting event to celebrate the opening of its much-anticipated rock musical, Tommy. For those who cannot attend, the Festival offers two other opportunities to practise your pinball moves: a Tommy-inspired pinball machine found at different locations in Stratford throughout the season and a virtual pinball game at http://tommypinball.com. Admission and all game play is free. For more information on the event, please visit: www.stratfordfestival.ca/pinball. Set to start previews on Saturday, May 4, at the Avon Theatre, the production features Robert Markus as Tommy, Jewelle Blackman as the Gypsy, Kira Guloien as Mrs. Walker, Jeremy Kushnier as Captain Walker, Paul Nolan as Cousin Kevin and Steve Ross as Uncle Ernie. Set Designer John Arnone, Choreographer Wayne Cilento and Costume Designer David C. Woolard, key members of the original creative team, have reunited for this production to join Musical Director and Supervisor Rick Fox, Lighting Designer Howell Binkley, Sound Designer Andrew Keister, Projection Designer Sean Nieuwenhuis and Fight Director Steve Rankin. Stratford Direct is the new daily return private bus service between Toronto and Stratford. Departing once daily from May 1 to 25 and October 1 to 20 and twice daily from May 27 to September 29 (on performance days only), the round trip costs only $20. March 26, 2013… The Stratford Festival is taking action to meet growing demand for what is shaping up to be one of the season’s hottest tickets, Mary Stuart, with a quarter of performances already sold out. Matinee performances of Mary Stuart have been added to the 2013 schedule on August 27 and September 20. Tickets are available online and through the box office. “This rarely performed play explores the fascinating relationship between two iconic figures from history – Mary, Queen of Scots, and Queen Elizabeth I – and features two of Canada’s finest actors, Seana McKenna and Lucy Peacock,” says Executive Director Anita Gaffney. “It is the first production directed by Antoni Cimolino since he took over as Artistic Director. His production of Cymbeline was one of the highlights of last season – and we had to schedule additional performances of it as well. Mary Stuart features Ms Peacock in the title role and Ms McKenna as Elizabeth I. Joining them are Ben Carlson as Lord Burleigh, Brian Dennehy as the Earl of Shrewsbury and Geraint Wyn Davies as the Earl of Leicester. The play, by Friedrich Schiller, follows a period in the life of Mary Stuart, when the former Queen of Scots has been imprisoned in England because her very existence poses a political and personal risk to her Protestant cousin, Elizabeth I. As Elizabeth hesitates over decreeing her rival’s fate, Mary pleads for a face-to-face meeting, and we see how religion can become a tool in the hands of cynical politicians who are willing to sacrifice lives in the supposed interests of the state. Dear Mary, Dear Elizabeth, in which Ms McKenna and Ms Peacock present readings of the letters of Mary Stuart and Elizabeth I, introduced and contextualized by Dr. Ted McGee. In the Studio Theatre on June 28 at 5:30 p.m., July 26 at 11 a.m., and August 31 at 11 a.m. $15. Table Talk, a buffet lunch followed by a talk on Mary Stuart by David G. John of the University of Waterloo. In the Paul D. Fleck Marquee on July 9 at 11:30 a.m. $37, with a cash bar. Elizabeth and Mary, Rival Queens: A Study of Leadership Lost and Won, a talk by Barbara Kyle, author of Blood Between Queens, which will be published in May 2013. In the Festival Theatre Lobby on July 10 at 11 a.m. Free admission. The Power of Women / Women in Power, a panel featuring author, playwright and activist Susan G. Cole, scholar Margaret Jane Kidnie and others. In the Studio Theatre Annex on August 18, 5:30 p.m. $10. The 2013 season begins on April 23 and runs until October 20, featuring Romeo and Juliet, Fiddler on the Roof, The Three Musketeers, The Merchant of Venice, Tommy, Blithe Spirit, Othello, Measure for Measure, Mary Stuart, Waiting for Godot and two new Canadian plays, Taking Shakespeare and The Thrill. To order tickets, call 1.800.567.1600 or visit www.stratfordfestival.ca. 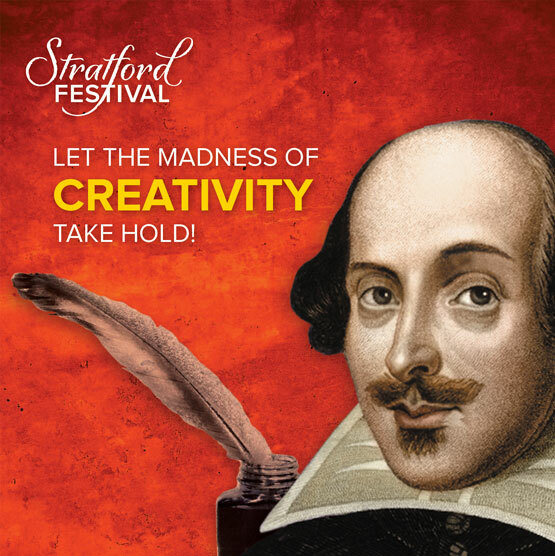 February 25, 2013… The Stratford Festival invites you to see Shakespeare in a whole new light, channeled through the remarkable perspectives of some of Canada’s most provocative thinkers and performers, Torquil Campbell, Adam Gopnik and Rufus Wainwright. On Shakespeare’s birthday, the Festival will be in Toronto to present the Shakespeare Slam, a thought-provoking and irreverent event to mark the launch of the Festival’s newest initiative, The Forum. This celebration of culture – both classical and pop – will look at how Shakespeare continues to entertain and inspire in today’s world. Like The Forum itself, the evening will offer insightful debate, along with music and other entertaining explorations. To start the evening, one of Canada’s most famous essayists, New Yorker staff writerAdam Gopnik, will face off against the country’s favourite hipster Torquil Campbell, lead singer of the indie rock band Stars and cultural contributor to CBC’s Q. The subject of their polemic: classical or pop culture – which has the reigning impact on our world? Rufus Wainwright, singer, songwriter and composer extraordinaire, will take the evening to new heights with a performance of some of his own songs set to Shakespeare’s words. The Slam will also feature a musical performance by Torquil Campbell, accompanied by multi-instrumentalist Julian Brown. They will perform Stars hits that are part of a new theatrical work, currently described as a reflection on Hamlet, which Mr. Campbell is developing for the Stratford Festival with Ann-Marie MacDonald and Alisa Palmer. Mr. Cimolino is launching The Forum in this, his first season as Artistic Director of the Stratford Festival, as part of a new direction – one he hopes will make a visit to Stratford an all-encompassing, stimulating and immersive cultural experience. “Through the diverse offerings of The Forum, I hope that we can offer transformational experiences that will allow our productions to resonate more deeply and personally with each patron,” says Mr. Cimolino. The Shakespeare Slam will be held at 8 p.m. on Tuesday, April 23, at Koerner Hall, 273 Bloor Street West, Toronto. Tickets, priced from $30 to $45, $20 for students, go on sale Tuesday, February 26, and are available through the Stratford Festival box office, at 1.800.567.1600, or Koerner Hall’s Weston Family Box Office, at 416.408.0208. Support for the inaugural season of The Forum is generously provided by Kelly and Michael Meighen, with media sponsorship provided by The Walrus. The Stratford Festival’s 2013 season begins on April 23. It features Romeo and Juliet, Fiddler on the Roof, The Three Musketeers, The Merchant of Venice, Tommy,Blithe Spirit, Othello, Measure for Measure, Mary Stuart, Waiting for Godot and two new Canadian plays, Taking Shakespeare and The Thrill, along with more than 150 Forum events. Why bring your children to the theatre? Most people develop a love for the theatre at a young age because a parent, grandparent or family friend took them to the see a live performance. Theatre can have an incredible impact on children; the chance to share the magic of live theatre with your family makes for unforgettable experiences. Guest blogger and long-time Stratford Festival fan Stephanie MacDonald shares her experience of attending the theatre as a child with her mother and now sharing and building those same memories with her own four children. I spent a day with my son Dakota filming a Simple Plan video at the Toronto Airport a few years ago. I remember thinking that it would probably be the last day I was going to spend alone with my teenage boy before life got in the way. I was incredibly wrong. Remembering the lessons I learned at my mother’s side, I started to bring him (then his siblings) to Stratford for momma-child days. My mom had often taken me to plays and concerts when I was little, down in Windsor. It was our special time alone. I can’t tell you the name of my first play. Theatre was always there. She also told me every year, when The Sound of Music was on TV, that in 1960 she had seen Christopher Plummer as Mercutio in Romeo and Juliet at the Stratford Festival. I knew it was the place to be. My children were raised believing that about Stratford, too. My ear was constantly turned to the happenings at Stratford when we lived in Smithers, BC. I relayed to them the plays of the season. This love of Stratford is one of the reasons why my last child (a girl after three boys) was named Cordelia. Then, in 2004, Mr. Plummer played Lear on the Festival Stage! When we moved back to Ontario and much closer to Stratford, I started buying their TiXX deals. It was affordable for me to take a child or two with me. My first play at Stratford starred Christopher Plummer. It was a dream fulfilled for me (and later for Dakota with The Tempest). I started taking my eldest boys to Stratford in 2008, when they were 13 and 11. It was Ben Carlson who took command of the stage that night as Hamlet. Dakota says now, at 17, that he didn’t really understand what going on, but it didn’t matter. He loved it, “like a foreign film. You don’t really understand, but you get wrapped up in it anyway.” Braeden was overwhelmed. Going to Stratford the past four seasons has brought us closer as a family. It is a place where we can be our better and more relaxed selves, where we can each learn something about life while watching the characters on stage. 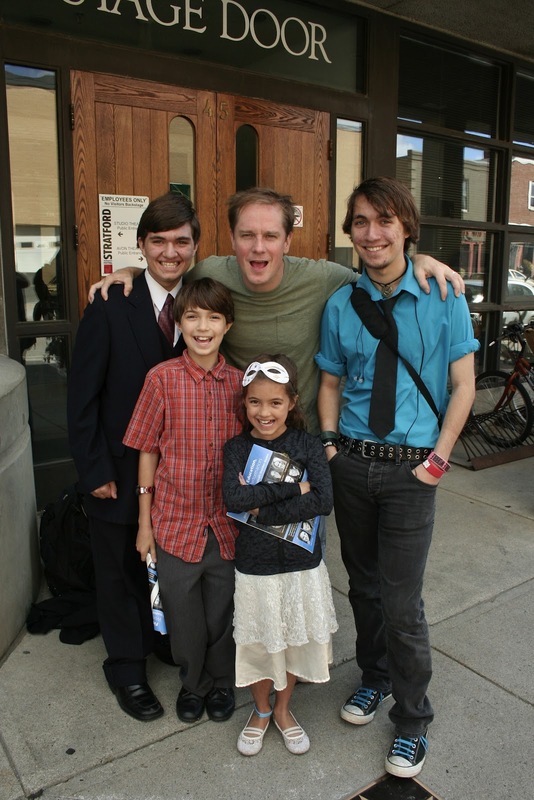 Luke, when still 10, watched the three-hour-long production of Cymbeline. Did he understand it all? No, but Shakespeare is best understood live and he grasped far more than he would have by watching the play rather than reading Cymbeline. 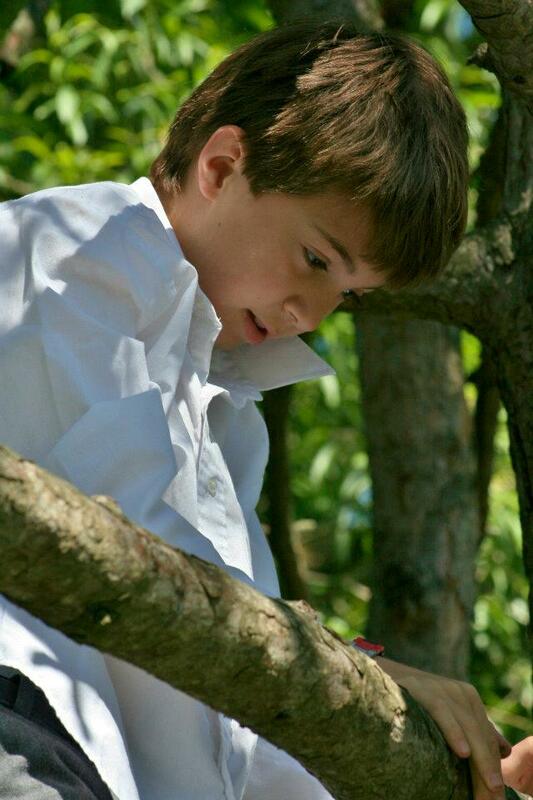 That day, Luke also spent two hours climbing trees along the Avon River, in his white shirt and dress pants. He didn’t rip or tear anything. We pack a lunch to eat along the Avon River. We dance, talk, meditate, or climb those trees. Being enveloped by the Festival and the town, we all feel safer talking to each other. We feel protected from the outside world. When I took my mom back last season (her first trip since high school), I can tell you I hadn’t felt that close to her since childhood. It was magical. When Cordelia and I spent our ‘Girl Day’ in Stratford last season, she fell in love with tap dancing because of 42nd Street. 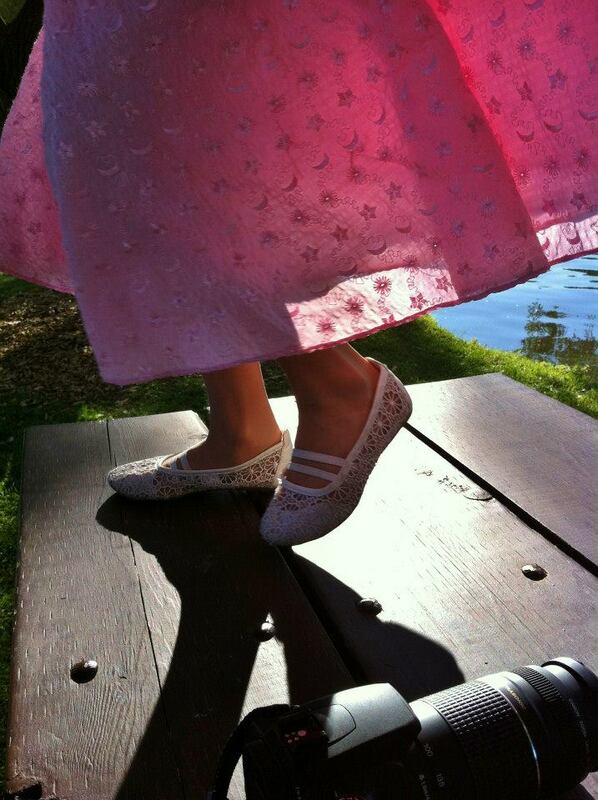 She danced everywhere after that, including our picnic table. She was amazed at the costumes and the actors in The Matchmaker. Not every child will be able to sit comfortably for Shakespeare or a musical. Bring them to productions which will entice them. Read the book or play beforehand. Costumes, swords, certain actors, lighting and music can really add to their enjoyment. My kids and their friends in our Kids4Bard group have read Romeo and Juliet together, acted it out and choreographed a few scenes. It has been wonderful to see their imaginations and their understanding grow while reading it, even eight-year-old Cordelia. It helped them gain an understanding of the language and storylines so they won’t be lost when we see it. One day, life will get in the way – growing up will happen. My treasured moments of the upcoming season will be the days along the Avon River, in the Stratford Festival’s seats, spending time alone with my children. Time will stand imperceptibly still and add handprints of love to our hearts. Our Family Experience program is a great and affordable way to take your children to the theatre – for every adult ticket you purchase, get up to four kids’ tickets for just $36. EXCLUSIVE FAMILY PROMOTION: Until, February 28, be sure to take advantage of our Three Musketeers promotion and get up to four kids’ tickets for just $1 each with each purchased adult ticket. Click here for full promot details.